December 27, 2013: And that’s when he knew. Our mam was sick. It was serious. There was doctors who looked as sour as pig slurry when the pit is opened for the first breath, and they shook their clean grey heads and clasped our da’s hand in theirs and patted his shoulder. And they said there was nothing but praying to do. But our da was not one for church singing and speaking with god. He was a farmer. Da refused to accept what the doctors had told him. He paid their bill and thanked them all the same, but he could not accept what they’d said. Da put on a cheerful voice – doctors were just men after all – and he said our mam was too pretty, and she was pretty. Da called her honey and sweet and sugar; she blushed at the new attention he gave her in front of us, all that looking and kissing and touching. And he said we should all of us look out for her, for our mam, and we should make everything easier for her in these harder times. There were days and days we went to the beach, and our mam stretched out on a towel looked as thin as a model and pretty like da said. 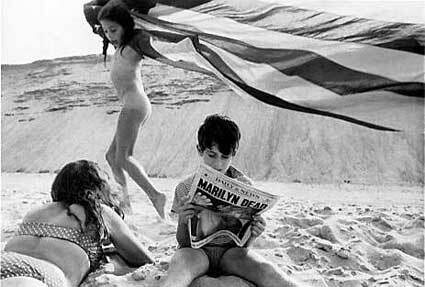 And Lucy kept singing and dancing across the sand and waving a striped towel above her head like it was a flag. And it was early August and the sun was still warm and the sea warm, too. Da brought us lunch when the animals at the farm were seen to and he kept asking our mam if she was alright. Then, one day the whole world turned on its head, and up was down and down was up, and pretty was no protection against dying. I remember the day and the moment. I was reading the morning newspaper and it said ‘Marilyn Dead’ on the front page and her pretty picture underneath. And hadn’t our da once said Marilyn was the prettiest girl that ever drew breath and our mam had said maybe she was. And Lucy’d asked if angels were prettier, and mam said she thought not. And there in the newspaper in letters big as not to be missed Marilyn was dead, and I knew then. Everything was clear in the days and weeks that followed. Da was trying too hard and there were cracks in his voice if you listened, and some days he sat on his horse out back and just stared at the dirt, and time just passed him by. And our mam got thin as sticks and weak with it, and her dress hung loose about her and her breath came in short snatches. And Lucy was the only one who did not know and Lucy counted the eggs each morning and brought the cheerful number back for our mam to marvel over. Then mam dead and nothing in any newspaper to let the world know. Sudden as thunder when it claps in a grey sky or lightning when it flashes. And they laid her in the churchyard ground with a white carved stone at her head and wilting flowers at her wet feet. And da lost all his words for the longest time and might have lost his wits, too. And Lucy just cried. It was only a year after when the President of the United States was shot in his car and he was pretty, too. I remember mam said so, way back. And I worried then over a girl called Martha, the prettiest girl in school, and everybody thought so, and she kissed me at our mam’s funeral and she held my hand on all the days following, and I held her hand, tight as not ever letting go, and I looked for her getting thinner or breathing short, just in case.